N.: Utagawa Sadamasu (after 1848, Kunimasu). Studio name: Kanaya. F.N. : Wasaburo. Go: Gochosai, Gochotei, Ichijuen, Ichijutei. Ukiyo-e printmaker. Lived and worked in Osaka. Son of a rich Osaka merchant. Pupil of Kunisada, and when his master changed his name to Toyokuni III, changed his name from Sadamasu to Kunimasu. 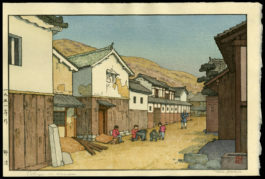 Worked generally in the style of Hiroshige; also made actor prints. At the end of his career, turned to the Shijo manner of painting. Taken in whole, or in part from: Roberts, Laurance P. A Dictionary of Japanese Artists: Painting, Sculpture, Ceramics, Prints, Lacquer. Weatherhill, Inc: New York. 1986.